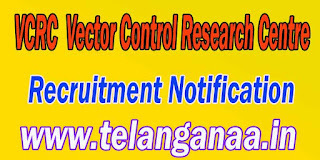 VCRC (Vector Control Research Centre) has 01 information officer posts approved for the notification setting. All incoming and interested potential candidates can offline Apply or before 29-07-2016 (29 July 2016). 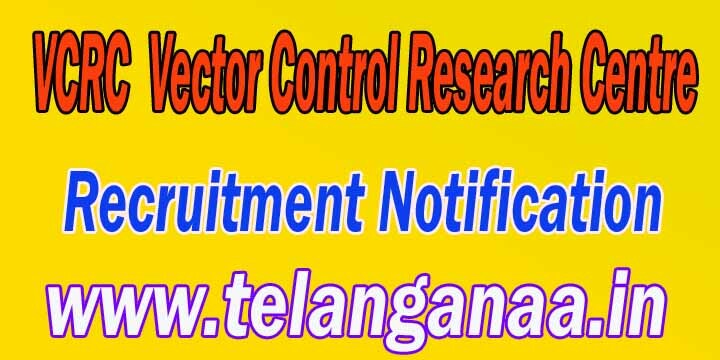 More detailed information on educational qualifications, age limit, selection, examination pattern, syllabus for VCRC (Vector Control Research Centre) Recruitment 2016-01 Information Officer Post is mentioned below. Age limit - Candidates upper age limit should not exceed 40 years. Age relaxations will apply according to the rules. Education - should have Master Degree Candidate (Library, Information Science) or an equivalent qualification from a recognized university conducted. Selection process - all suitable candidates are cloistered Selected Based on their performance. Pay Scale - Rs 15,600 -. 39,100 / - With 6600 / - Grade Pay. How to apply - all coming and interested potential candidates can request form on official website http://vcrc.res.in to download. along with relevant certificates (mentioned in the detailed display) to the address below on or before July 29, 2016 The application form after filling candidate must send hard copy application. Address -The Director, Vector Control Research Centre, Medical Complex, Indira Nagar, Pondicherry - 605 006.
receiving Deadline for Hard Copy of application form is: 29-07-2016. Click here for VCRC Detailed Advertisement.